Danner Men's 10600 Rain Forest Brown USA-Made Waterproof Boots have to be designed with a tough logger look. They're water-resistant, wear-resistant, and manufactured for the toughest jobs. You didn't expect a pair of ballet slippers, did you? The dark brown, 8 ... (see full details) (see specifications) #DNN10600. Danner Men's 10600 Rain Forest Brown USA-Made Waterproof Boots have to be designed with a tough logger look. They're water-resistant, wear-resistant, and manufactured for the toughest jobs. You didn't expect a pair of ballet slippers, did you? The dark brown, 8-inch logger uppers on this premium footwear is manufactured with full-grain leather that resists the daily wear and tear. These uppers are designed to be non-processed and left in their naturally flexible state. Meaning the rich full-grain leather is breathable, pliant, and incredibly durable against wind and water. Waterproof Gore-Tex lines the interior of each of these shoes to prevent moisture from getting to your skin. The Gore-Tex material is 100% waterproof, and it's breathable to allow sweat and heat to escape keeping your feet dry throughout the day. In addition these boots are equipped with lightweight fiberglass shanks that help keep your arches supported, preventing painful muscle strain. Danner's hand-crafted stitchdown construction joins the Vibram 132 Montagna soles to the leather. The bottom edges of leather are folded and stitched to the soles, so these 8-inch men's boots can be recrafted if you like. The Vibram outsoles have angled lugs for improved traction on any type of terrain. Danner Men's 10600 Brown Rain Forest Waterproof USA-Made Boots were constructed with triple stitching, so each stitch is made with three threads for durability. These Rain Forest boots were made in the USA for the toughest jobs, with a style to match. Order your pair online from the Working Person's Store today. These Danner boots are by far the most comfortable boots that I have ever worn. I have purchased three pairs of different styles. The Rainforest model comes as advertised. They are a very stable, very waterproof boot. I do a lot of trench work and I wouldn't want any other boot on my foot. An added bonus is that they are made in America, which is a nice touch. 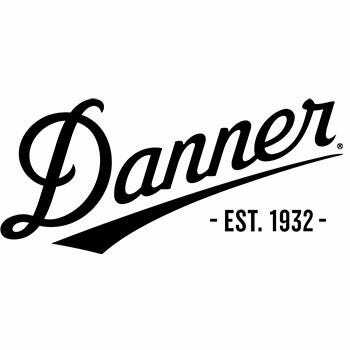 Danner Boots: Men's USA-Made 10600 Brown Waterproof Rain Forest Work Boots is being added to your cart.